To be in touch with the world around us is one thing but getting in tune with energies that we cannot see with the naked eye is another. Some empathic people can feel these energies surrounding them, be they ghosts of past lives or loved ones that have moved on to the other side. There are people who can make these connections easily while others must work at it and learn how to listen. Essential oils are helpful tools that some psychic people have been using for years to develop their abilities. If you are unfamiliar with essential oils and the powers of aromatherapy, then keep reading. It’s an easy way to tap into your natural skills, and they smell great! Essential oils are pure volatile compounds that are extracted from the host plant they are named after. Lavender essential oil is from lavender flowers, chamomile is from the flowers of that plant, so on and so forth. There are hundreds of essential oils that have been proven to have their own unique set of benefits. Some of these oils help with depression, others anxiety, some with muscle aches and others with skin disorders or allergies. No two essential oils are the same and blending them is a great way to create a potion for your own personal use. For example, blending lavender and chamomile oils is a great way to calm the mind. Below we’ve listed the best essential oils for tapping into your psychic ability, but first, we want to discuss exactly how these powerful tools are meant to be used. Depending on the need, these volatile compounds can be applied in one of three ways to help along with your Mediumship training. This simply means to breathe the scents in. 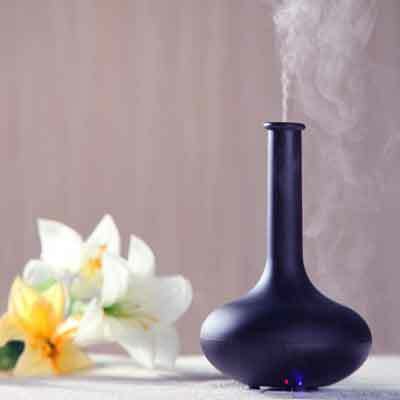 We can do this by just opening the bottle, but if you want to fill the room with your chosen scents, then you need a device like this rainstone diffuser to break the oils up and emit them into the air. Breathing in the scents and absorbing their power is the basis behind the term aromatherapy. This is the best way to use essential oils to tap into your psychic abilities. First, you need to set an intention, which can be done while meditating while diffusing your scents. Writing down your intentions in a journal is another way to put them out into the universe. Of course, inhaling isn’t the only way to reap the benefits of essential oils. Here are some other ways. Another great way to reap the benefits of these substantial extracts is to apply them to your body via massage therapy. When it comes to psychic potential, putting some of the oils we’ve listed below onto your wrists, the back of your neck, and your temples are a great way to penetrate your outer layer and take in their advantages. They must always be diluted with a carrier substance like sweet almond or olive oil. The third and final way to take advantage of essential oils and their benefits is to ingest them. Some people will put a drop of lavender into a pitcher of lemonade, but lavender has strange effects on prepubescent boys, so this isn’t a good idea if you have a young son. When it comes to tapping deeper into your psychic powers, the ingestion method isn’t necessary. There are too many risks and we don’t recommend you consume any of them internally. Inhalation after you set an intention is the best application with the use of a diffuser. All these oils have more benefits than what we’ve listed but we feel it’s these specific things about that oil that helps the user tap into their psychic abilities. Our minds need to be clear and clutter free, so we can focus on the incoming vibrations. The ones listed can have that type of effect on the user. Tapping into our power isn’t as easy as just wishing it to be. Sure, some of us are more in tune to their surrounding vibrations but others need a little help. Aromatherapy is a wonderful tool for enhancing your psychic awareness. What happens after that is completely up to you.